in three very different parts of the world. Yoani Sánchez from Cuba, Zeng Jinyan from China and Farnaz Seifi from Iran. about the oppressive regimes in which they live. by their governments and the powers that be. and still they write and still they talk. and still they find a way to get the word out against all odds. 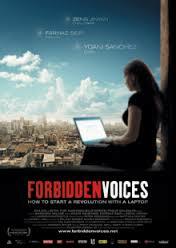 this is a powerful film about their fight for human rights and for the freedom of speech. i will not soon forget these courageous women or this film. the documentary won the amnesty international award 2013 and the WACC SIGNIS human rights award 2012, and was nominated for the swiss film award and the prix de soleure in 2013. This one sounds interesting and I don’t use to watch either film or TV. Reblogged this on The Writers Desk. thank you. there is power in spreading the word. I hope and pray that this does not happen in our America. we will not let it. You’re right, we won’t. We have fought too hard and lost many heros for the freedom we enjoy. Very brave of these women. To awful to live under an oppressive regime. I will see this movie and I will remember your poem. yes, to both. yoani was to receive an award from hillary clinton, however they have cancelled her travel visa over and over. Sounds like a must-watch film. I’ll have to hunt it down and add it to my cue. Thanks for the recommendation! I will watch it. Thank you Beth for bring it to my attention. Sounds like one of those movies you just can’t miss. Your quote from Woodrow Wilson was an interesting addition to this movie review. I do not think you select the quotes on chance. spot on. you are an astute reader. Thank you, again, Beth. Something I will watch now that I know about it. I think this is exciting that these female bloggers (and families) are facing all kinds of challenges and despite them still fighting for women's rights! It is powerful, frightening and painful but those voices must be heard, as well as changes made. Hello Beth. I must watch this. Thanks for posting and thanks to Patricia for pointing us to this. I admire brave people. Not sure I have it in me..and I hope I never find out. This looks very interesting and inspiring. I will look for it. Now our government is deporting activist immigrants who grew up here. That is wrong. I know, right? I guess everyone should learn Spanish, even if they aren’t from Mexico… craziness. Nice. I’m definitely adding this to my watch list. This shows the power of storytelling! !